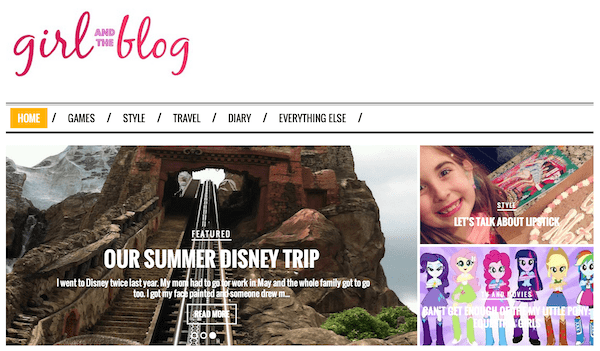 My baby girl has a blog — I can’t believe it!! Natalie has been begging me for WEEKS to buy http://girlandtheblog.com and I just couldn’t find the time to get it together. There’s a bit of a time commitment that goes into building out a blog. Finally, I just couldn’t HEAR IT ANYMORE. And so we did it! Natalie has her own blog! I am so excited for her. It is such a treat to see her doing what I do. She wants to write about her favorite movies and songs and toys and clothes. AHHHHHHHHH. I am freaking out that’s how excited I am. Anyway, OF COURSE I am helping her. She doesn’t know how to categorize things and link to other sites just yet. So I do the finishing touches of each post. But her voice is finally online which is exactly what she wanted. If you have little ones – have them check it out!